In chemistry and biology a cross-link is a bond that links one polymer chain to another. These links may take the form of covalent bonds or ionic bonds and the polymers can be either synthetic polymers or natural polymers (such as proteins). In polymer chemistry "cross-linking" usually refers to the use of cross-links to promote a change in the polymers' physical properties. Although the term is used to refer to the "linking of polymer chains" for both sciences, the extent of crosslinking and specificities of the crosslinking agents vary greatly. As with all science, there are overlaps, and the following delineations are a starting point to understanding the subtleties. Crosslinking is the general term for the process of forming covalent bonds or relatively short sequences of chemical bonds to join two polymer chains together. The term curing refers to the crosslinking of thermosetting resins, such as unsaturated polyester and epoxy resin, and the term vulcanization is characteristically used for rubbers. When polymer chains are crosslinked, the material becomes more rigid. Typical vinyl ester resin derived from bisphenol A diglycidyl ether. Free-radical polymerization gives a highly crosslinked polymer. Cross-links can be formed by chemical reactions that are initiated by heat, pressure, change in pH, or irradiation. For example, mixing of an unpolymerized or partially polymerized resin with specific chemicals called crosslinking reagents results in a chemical reaction that forms cross-links. Cross-linking can also be induced in materials that are normally thermoplastic through exposure to a radiation source, such as electron beam exposure, gamma radiation, or UV light. For example, electron beam processing is used to cross-link the C type of cross-linked polyethylene. Other types of cross-linked polyethylene are made by addition of peroxide during extruding (type A) or by addition of a cross-linking agent (e.g. vinylsilane) and a catalyst during extruding and then performing a post-extrusion curing. Where chemical cross-links are covalent bonds, physical cross-links are formed by weak interactions. For example, sodium alginate gels upon exposure to calcium ion, which allows it to form ionic bonds that bridge between alginate chains. 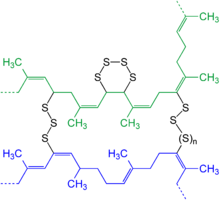 Polyvinyl alcohol gels upon the addition of borax through hydrogen bonding between boric acid and the polymer's alcohol groups. Other examples of materials which form physically cross-linked gels include gelatin, collagen, agarose, and agar agar. Note: A rubber which cannot be reformed by heat or chemical treatment is called a thermoset elastomer. On the other hand, a thermoplastic elastomer can be molded and recycled by heat. The aforementioned process of applying a permanent wave to hair is one example of oxidative cross-linking. In that process the disulfide bonds are reduced, typically using a mercaptan such as ammonium thioglycolate. Following this, the hair is curled and then "neutralized". The neutralizer is typically an acidic solution of hydrogen peroxide, which causes new disulfide bonds to form under conditions of oxidation, thus permanently fixing the hair into its new configuration. Proteins naturally present in the body can contain crosslinks generated by enzyme-catalyzed or spontaneous reactions. Such crosslinks are important in generating mechanically stable structures such as hair, skin, and cartilage. Disulfide bond formation is one of the most common crosslinks, but isopeptide bond formation is also common. Proteins can also be cross-linked artificially using small-molecule crosslinkers. Compromised collagen in the cornea, a condition known as keratoconus, can be treated with clinical crosslinking. In biological context crosslinking could play a role in atheroscelerosis through AGEs which have been implicated to induce crosslinking of collagen which may lead to vascular stiffening. A variety of crosslinkers are used to analyze subunit structure of proteins, protein interactions, and various parameters of protein function by using differing crosslinkers, often with diverse spacer arm lengths. Subunit structure is deduced, since crosslinkers bind only surface residues in relatively close proximity in the native state. Protein interactions are often too weak or transient to be easily detected, but by crosslinking, the interactions can be stabilized, captured, and analyzed. In-vitro cross-linking method, termed PICUP (photo-induced cross-linking of unmodified proteins), was developed in 1999. They devised a process in which ammonium persulfate (APS), which acts as an electron acceptor, and tris-bipyridylruthenium (II) cation ([Ru(bpy)3]2+) are added to the protein of interest and irradiated with UV light. PICUP is more expeditious and high yielding compared to previous chemical cross-linking methods. Other examples of polymers that can be crosslinked are ethylene-vinyl acetate–as used in solar panel manufacturing – and polyethylene. Crosslinking is often measured by swelling tests. The crosslinked sample is placed into a good solvent at a specific temperature, and either the change in mass or the change in volume is measured. The more crosslinking, the less swelling is attainable. Based on the degree of swelling, the Flory Interaction Parameter (which relates the solvent interaction with the sample), and the density of the solvent, the theoretical degree of crosslinking can be calculated according to Flory's Network Theory. Two ASTM standards are commonly used to describe the degree of crosslinking in thermoplastics. In ASTM D2765, the sample is weighed, then placed in a solvent for 24 hours, weighed again while swollen, then dried and weighed a final time. The degree of swelling and the soluble portion can be calculated. In another ASTM standard, F2214, the sample is placed in an instrument that measures the height change in the sample, allowing the user to measure the volume change. The crosslink density can then be calculated. ^ Jenkins, A. D. (1996). "Glossary of basic terms in polymer science (IUPAC Recommendations 1996)" (PDF). Pure and Applied Chemistry. 68 (12): 2287–2311. doi:10.1351/pac199668122287. ^ Hans Zweifel; Ralph D. Maier; Michael Schiller (2009). Plastics additives handbook (6th ed.). Munich: Hanser. p. 746. ISBN 978-3-446-40801-2. ^ Gent, Alan N. (1 April 2018). Engineering with Rubber: How to Design Rubber Components. Hanser. ISBN 9781569902998. Retrieved 1 April 2018 – via Google Books. ^ Pham, Ha Q.; Marks, Maurice J. (2012). Epoxy Resins. Ullmann's Encyclopedia of Industrial Chemistry. doi:10.1002/14356007.a09_547.pub2. ISBN 978-3527306732. ^ "Shrink Wrap". symmetry magazine. Retrieved 28 December 2017. ^ Hecht, Hadas; Srebnik, Simcha (2016). "Structural Characterization of Sodium Alginate and Calcium Alginate". Biomacromolecules. 17 (6): 2160–2167. doi:10.1021/acs.biomac.6b00378. PMID 27177209. ^ Casassa, E.Z; Sarquis, A.M; Van Dyke, C.H (1986). "The gelation of polyvinyl alcohol with borax: A novel class participation experiment involving the preparation and properties of a "slime"". Journal of Chemical Education. 63: 57. doi:10.1021/ed063p57. ^ Wollensak G, Spoerl E, Seiler T. Riboflavin/ultraviolet-a-induced collagen crosslinking for the treatment of keratoconus. Am J Ophthalmol. 2003 May;135(5):620-7. ^ Prasad, Anand; Bekker, Peter; Tsimikas, Sotirios (2012-08-01). "Advanced glycation end products and diabetic cardiovascular disease". Cardiology in Review. 20 (4): 177–183. doi:10.1097/CRD.0b013e318244e57c. ISSN 1538-4683. PMID 22314141. ^ "Pierce Protein Biology - Thermo Fisher Scientific". www.piercenet.com. Retrieved 1 April 2018. ^ Kou Qin; Chunmin Dong; Guangyu Wu; Nevin A Lambert (August 2011). "Inactive-state preassembly of Gq-coupled receptors and Gq heterotrimers". Nature Chemical Biology. 7 (11): 740–747. doi:10.1038/nchembio.642. PMC 3177959. PMID 21873996. ^ a b c Fancy, David A.; Kodadek, Thomas (1999-05-25). "Chemistry for the analysis of protein–protein interactions: Rapid and efficient cross-linking triggered by long wavelength light". Proceedings of the National Academy of Sciences. 96 (11): 6020–6024. doi:10.1073/pnas.96.11.6020. ISSN 0027-8424. PMC 26828. PMID 10339534. ^ Suchanek, Monika; Anna Radzikowska; Christoph Thiele (April 2005). "Photo-leucine and photo-methionine allow identification of protein–protein interactions in living cells". Nature Methods. 2 (4): 261–268. doi:10.1038/nmeth752. PMID 15782218. Retrieved 2008-07-18. ^ solar cell manufacturing and solar panel production, at 3:25, is "a layer of EVA", and another.... later bonded around the solar cells themselves under heat and pressure, "causing cross-linking of the EVA to form a chemical bond which hermetically seals the module. ", accessed 4 September 2018. ^ Reyes-Labarta, J.A. ; Marcilla, A.; Sempere, J. (2011). "Kinetic Study of the Thermal Processing and Pyrolysis of Crosslinked Ethylene Vinyl Acetate-Polyethylene Mixtures". Industrial & Engineering Chemistry Research. 50 (13): 7964–7976. doi:10.1002/ie200276v (inactive 2018-09-11). ^ Reyes-Labarta, J.A. ; Olaya, M.M. ; Marcilla, A. (2006). "DSC and TGA Study of the Transitions Involved in the Thermal Treatment of Binary Mixtures of PE and EVA Copolymer with a Crosslinking Agent". Polymer. 47 (24): 8194–8202. doi:10.1016/j.polymer.2006.09.054. ^ "Crosslinking and Tires". ebeam.com. Retrieved 1 April 2018. ^ Lien, S.-M.; Li, W.-T.; Huang, T.-J. (2008). "Genipin-crosslinked gelatin scaffolds for articular cartilage tissue engineering with a novel crosslinking method". Materials Science and Engineering: C. 28 (1): 36–43. doi:10.1016/j.msec.2006.12.015. ^ "ASTM D2765 - 16 Standard Test Methods for Determination of Gel Content and Swell Ratio of Crosslinked Ethylene Plastics". www.astm.org. Retrieved 1 April 2018. ^ "ASTM F2214 - 16 Standard Test Method for In Situ Determination of Network Parameters of Crosslinked Ultra High Molecular Weight Polyethylene (UHMWPE)". www.astm.org. Retrieved 1 April 2018.